The game will be the 164th league and cup meeting between Albion and Everton. The Toffees currently lead the way in the victory stakes with 67 wins compared to Albion's 59. There have been 20 previous Premier League meetings with Everton winning ten and Albion six. The Baggies' last game on this date took place in 2011 when they suffered a 2-1 defeat against Chelsea in a Premier League clash at Stamford Bridge. The club's last win on August 20 came in 2005 when a Geoff Horsfield double gave a Bryan Robson-led side a 2-1 win over Portsmouth at The Hawthorns. Everton's last game on this date took place in 2012 - the Toffees beating Manchester United 1-0 at Goodison Park thanks to a Marouane Fellaini strike. The two clubs have met once previously on August 20 - in 1985 when Adrian Heath hit both goals as Everton recorded a 2-0 win at Goodison Park in a First Division fixture. Albion's last six games: Crystal Palace (A) 1-0; Real Mallorca (A, Fr) 0-1; Torquay United (A, Fr) 1-2; Plymouth Argyle (A, Fr) 0-0; Vitesse Arnhem (A, Fr) 2-1; Kidderminster Harriers (A, Fr) 2-1. Everton's last six games: Spurs (H) 1-1; Espanyol (H, Fr) 0-1; Manchester United (A, Fr) 0-0; Real Betis (A, Fr) 1-1; Dynamo Dresden (A, Fr) 1-2; MK Dons (A, Fr) 3-1. Long-term injury victim Chris Brunt remains out but otherwise Baggies' boss Tony Pulis has a full squad to choose from. Winger Yannick Bolasie could make his Everton debut following his big-money move from Crystal Palace. Fellow new signing Ashley Williams could also make his first Toffees' appearance if he passes a late fitness test. Former Albion loanee Romelu Lukaku has returned to training following a heel injury and may feature. Swarbrick officiated one Albion game last season - the 1-1 draw with Swansea City at The Hawthorns in February. The Lancashire official also took charge of one Everton game during 2015/16 - their 2-1 win at home over Bournemouth in April. Swarbrick issued 98 yellow cards and seven red in the 35 games he officiated last season. The very first meeting of the clubs took place in April 1888 in a friendly match at Anfield, the Baggies running out 1-0 winners thanks to a goal from Jem Bayliss. Both Albion and Everton are founder members of the Football League and the first competitive meeting between the two sides came during the league's inaugural season in 1888/89. The first game took place at Everton's Anfield Road ground in December, Albion running out 4-1 winners thanks to two goals from Billy Bassett and one apiece from Walter Perry and William Hendry. The return game at Stoney Lane saw Albion complete the double over the Merseysiders thanks to a 1-0 win in what was the last game of the season, Fred Crabtree the goalscorer. Albion's biggest victory against Everton came in December 1935 at The Hawthorns, legendary striker William 'G' Richardson scoring two of the goals in a 6-1 stroll. Other big wins for the Baggies' include 6-2 in March 1960 when Derek Kevan scored five of the goals, 5-0 in 1923 and 5-2 in 1919. The Toffees' best result against Albion is 7-1, achieved in 1893 at Goodison Park, Jack Southworth scoring six of the Everton goals. 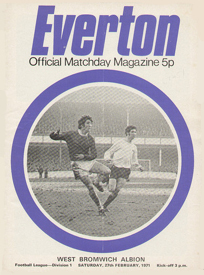 Everton have also recorded 6-1, 6-2 and 6-3 victories against the Baggies over the years. Albion have beaten Everton four times at The Hawthorns in Premier League action, only against Sunderland (6) have the Baggies won more games against a team at home. Albion: Myhill, Dawson. Evans, Olsson (Chester, 28), Brunt, Fletcher, Yacob (Lambert 85), McClean, Morrison, Berahino, Rondon (Gardner 68). Subs not used: Lindegaard (gk), Anichebe, Lambert, McManaman, Gnabry. Everton: Howard, Galloway, Mori, Jagielka, Browning (Gibson 72), Naismith (Kone 72), Barkley, Barry, McCarthy, Deulofeu, Lukaku (Lennon 88). Subs not used: Robles (gk), Gibson, McGeady, Oviedo, Osman. Romelu Lukaku inspired Everton to a stunning fightback at West Brom as the Toffees recovered from 2-0 down to win 3-2. The former Baggies striker scored twice and set up Arouna Kone as the visitors scored twice in the final 15 minutes to steal the points. Saido Berahino and Craig Dawson had put the Baggies 2-0 ahead but Lukaku hit back immediately after Dawson's header nine minutes after the break. The 22-year-old scored 17 goals during an impressive loan spell at Albion from Chelsea in 2012-13 and ignited Everton's challenge with Kone's impact also crucial, the forward scoring within three minutes of coming on as a second-half substitute. It was the first time Everton had come back to win a game in the Barclays Premier League since May 1994 - when they beat Wimbledon 3-2 to stay in the top flight. There was little hint of the drama to come, which left Albion winless at home in the Premier League this season, during a wretched and instantly forgettable first half which was only lit up by Berahino's opener. Without the sidelined John Stones, out with a knee injury, Ramiro Funes Mori stepped in for his full league debut but the Everton defender was at fault for Albion's first goal after a dull first 25 minutes. Only the visitors created a clear cut chance before the hosts struck when Ross Barkley blew his lines from eight yards after 29 minutes. The England midfielder started the move with a neat dummy before the ball was worked to Gerard Deulofeu on the right. His fine low pass dissected the Albion defence only for an on-rushing Barkley to wretchedly miscue his shot wide. It was a horrible miss and one which the Toffees would pay for when the Baggies opened the scoring four minutes before the break. Mori had enjoyed a untroubled half but imploded when he lost the ball near the halfway line after trying to run out of defence. It found Morrison and his excellent throughball for Berahino saw the striker slip in a low shot via Tim Howard's leg. It was the striker's second goal since returning to the starting line-up following his deadline day strike threat and underlined why the Baggies were so determined to keep him away from Tottenham. Buoyed, James McClean fired over immediately after the restart and Mori escaped a penalty shout after pushing over Salomon Rondon. Darren Fletcher then had a header turned needlessly wide by Howard after 54 minutes and Albion doubled their lead from the resulting corner. Phil Jagielka and Barkley got themselves in a mess trying to pick up Dawson and Jonny Evans which allowed Dawson to nod in Chris Brunt's deep delivery. Instantly, though, Everton hit back when Lukaku headed Deulofeu's cross past Boaz Myhill. With that the game turned even if Everton's desperation was growing and James McCarthy was booked for an awful dive in the box with 20 minutes left. Yet Kone levelled four minutes later - and just three minutes after coming on. Again, Lukaku did brilliantly on the edge of the box to spot Kone's run and threaded the ball through to the former Wigan forward, who was just onside, to drill past Myhill. The Baggies were shellshocked and former Chelsea striker Lukaku was not finished as he wrapped up Everton's comeback with six minutes left. There was a hint of handball when he met Deulofeu's cross by splitting Dawson and James Chester but with Myhill slow to react Lukaku smashed in from close range to win it. Everton defender Ashley Williams was in the youth system at The Hawthorns during the late 1990s before being released at the age of 16. Romelu Lukaku spent the 2012/13 season on loan at The Hawthorns from Chelsea, hitting 17 goals in the process. He joined Everton, again on a season long loan, on transfer deadline day 2013 before he made a permanent £28 million move to Goodison Park in July 2014. Amongst the players to have turned out at various levels for both clubs are: Brett Angell, Victor Anichebe, Laurie Bell, William Bowser, Walter Boyes, David Burrows, John Cameron, Kevin Campbell, Llew Davies, Stan Davies, Thomas Dilly, Peter Eastoe, Albert Flewitt, Tony Grant, Andy Gray, Philip Griffiths, Willie Groves, Andrew Hannah, Asa Hartford, Paul Holmes, William Jordan, Kevin Kilbane, Andy King, Joleon Lescott, Ken McNaught, Bruce Rankin, Syd Rawlings, Fred Rouse, John Thomas, Mickey Thomas, Imre Varadi and Steve Watson. Former Baggies' boss Alan Irvine joined Everton in 1981 from Scottish club Queens Park. He spent three years with the Toffees before leaving for Crystal Palace in 1984. Irvine returned to Goodison Park in 2002 as assistant to David Moyes, a role he held for five years before he left to take over as Preston North End's manager. He returned to Everton once more in 2011 to work with the club's academy. Wilf Dixon was a trainer at both clubs.